Nearly 3,000 WA schoolgirls aged between 13 and 15 participated in the Telethon Kids Institute Study, which assessed the impact of the Virtual Infant Parenting (VIP) program. Half of the girls participated in the VIP program, where they were required to care for a robot baby or infant simulator, while the other half was given the standard health education curriculum. Researchers were given access to the girls’ de-identified medical records until they were 20 years old. They found 17 per cent of those who did the VIP program had fallen pregnant by then, compared to 11 per cent of those who did not. “The results were unfortunately not what we were hoping for,” lead investigator Dr Sally Brinkman said. Researchers also found 53.8 per cent of the pregnancies among girls who participated in the robot program were terminated, compared to 60.1 per cent of those who did not. Dr Brinkman said the study did not explore why the program had failed, but anecdotally it seemed the girls enjoyed the process of caring for a baby. 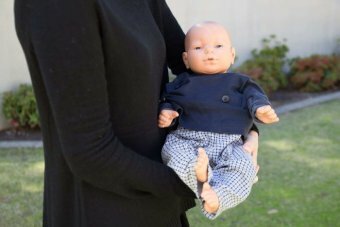 “Most of [the students] really enjoyed the program and they liked it, they got a lot of attention when they had the infant simulators… they definitely weren’t put off,” she said. Dr Brinkman has recommended schools stop using such programs. “In terms of trying to prevent teenage pregnancy, I think on the basis of our results, I don’t think it’s a good public spend,” she said. Infant simulators are used in many countries around the world as part of health education programs.